The face is composed of soft tissue over an underlying skeletal framework. This construct allows for complex facial animations and expressions. The nose, positioned at the center of the face, is the most prominent facial feature. The face of a child with cleft lip and nose often draws attention that negatively impacts the child’s psychosocial development. In current practice, plastic surgeons are better able to reconstruct the faces of children with cleft lip and nose to near-normal anatomic form and physiologic function. With early surgical correction, children born with cleft lip and nose have the chance to develop positive social interactions and better self-esteem early in life, along with good speech and attractive smiles. Cleft nasal images are shown below. Typical appearance of cleft nasal deformities. Cleft nasal deformity can be seen even in patients with incomplete cleft lip. While multiple techniques are available for the repair of cleft nasal deformity, the universal surgical principles are to restore the normal nasal anatomy and function affected by clefting and to anticipate the secondary deformities that appear with subsequent growth and development. The optimal timing for the reconstruction of the cleft lip nasal deformity was once unresolved. [2, 3, 4, 5, 6] Multiple long-term studies published by experienced cleft surgeons now show that early nasal reconstruction has no adverse effects on growth. [7, 8, 9] The current standard of care is to reconstruct the nose at the time of primary cleft lip repair. For information on cleft lip repair techniques, see Medscape Reference articles Unilateral Cleft Lip Repair and Craniofacial, Bilateral Cleft Lip Repair. Although plastic surgeons continue to improve outcomes in the management of cleft lip and nose defects, secondary corrections and revisions are still common. The families of children with cleft lip and nose should be counseled that while primary nasal repair sets up a "more normal" vector for growth, their child may benefit from a touch-up revision before the school years and, ultimately, a formal rhinoplasty at the conclusion of orthodontic/orthognathic care. The ultimate goals of surgical care for children with cleft lip and nose are an aesthetic facial appearance, a beautiful smile, acceptable speech, and normal psychosocial development. In 1961, Stenstrom and Oberg proposed that the nasal tip deformity was caused by the imbalance of muscular pull on both the cleft and noncleft sides. They believed that by repositioning muscle and bony elements in proper dynamic anatomic alignment, the nose would develop into a more natural place, thereby avoiding further surgery. The incidence of cleft lip and palate is around 1:1000, with a racial preponderance toward Asian and Hispanic populations. In unilateral clefts, left-sided cleft lip is more common than right. Fifty percent of all unilateral clefts involve both lip and palate, while only 20% of unilateral clefts involve lip only. The incidence of cleft palate deformities is higher in populations who have a familial history of a similar deformity. Nasal deformity is seen with almost all cleft lips, with exceptions in the very mild clefts in which the ala base is unaffected. In utero developmental processes are complex. However, the production of the human face is even more complicated because it basically recapitulates the evolutionary history of vertebrate development. To fully understand the intricacies of the cleft anomaly, clinicians must develop a comprehensive understanding of both normal and pathologic embryologic development. Embryologic facial growth is produced by the fusion of 5 facial swellings: 2 maxillary, 2 mandibular, and an unpaired frontonasal. Incomplete or partial fusion of any of these swellings or processes results in the development of either a unilateral or a bilateral facial cleft. Specifically, plastic surgeons working with cleft lip and nasal abnormalities are interested in anomalies that result from the failure of the maxillary swelling to fuse with the frontonasal or intermaxillary processes. Although cleft lips and cleft palate often occur together, the 2 defects differ in their distribution. For this reason, they are considered distinct entities. During the third week of embryogenesis, facial growth commences. At this point, the embryo has already divided into a 3-layered germ disc, including the face and its mesodermal precursor structures. At this time, it is ready for the future organogenesis that occurs during the fourth to eighth weeks. During the fourth week, the neurocrest develops and detaches from the lateral lips of the neurofold and migrates into different locations. Some of the neurocrest cells are intimately involved in the formation of the mouth and nasal structures. These neurocrest cells migrate to the developing first 5 pairs of pharyngeal arches on either side of the pharyngeal foregut on day 22 and are important to the ultimate development of the cartilaginous rudiments of the nose and face. These arches correspond to numbers 1, 2, 3, 4, and 6 of the primitive vertebrae or branchial arches. Each arch consists of an outer covering of ectoderm, an inner covering of endoderm, and a core of mesoderm, which includes contributions from adjacent somites and the neurocrest cells. The arches are separated externally by ectoderm lying in pharyngeal clefts and internally by endoderm lying in pharyngeal pouches. In summary, the clinical spectrum of congenital facial clefts basically results from the failure of these facial processes to correctly fuse. Simultaneously, nasal development commences as a pair of thickened ectodermal nasal placodes located on the frontonasal or intermaxillary processes. The central portion of each placode invaginates to form the epithelium of the nasal passage, while the raised margin of the placode gives rise to the nose, the philtrum of the upper lip, and the primary palate. Nasal passages are formed by the continued deepening of the nasal pits. At the end of the sixth week, the deepened nasal pits fuse to form a single, large ectodermal nasal sac lying superoposterior to the intermaxillary process. From the end of the sixth week to the beginning of the seventh week, the floor and posterior wall of the nasal sac proliferate to form a thickening plaque-like thin fin of ectoderm separating the nasal sac from the oral cavity. This structure is termed the nasal fin. Vacuoles develop in the nasal fin and fuse with the nasal sac, thus enlarging the sac and thinning the fin to a thin membrane called the oral nasal membrane. This separates the sac from the oral cavity. This membrane ruptures during the seventh week to form an opening termed the primitive choana. At this stage, the floor of the nasal cavity is formed by a posterior extension of the intermaxillary process called the primary palate. A commonly accepted process is that the facial mesenchyme originating from the cranial neurocrest cells later gives rise to the skeletal and connective tissues of the face. Conversely, the ectoderm of the central face apparently plays the most significant role in ultimate nasal development. The epithelial wall of the upper lip is reinforced by migrating mesoderm, and 2 paired arches of ectoderm appear. These become the nose. Ectodermal cells proliferate and begin to sculpt an amorphous cell mass into a finite structure by cellular polarization that causes alignment in one specific plane. The processes leading to normal development are undoubtedly complicated. Probably, relatively few alterations are responsible for the vast majority of clinical clefts. Environmental factors, from the oxygen concentration to the presence of adverse environmental factors such as phenytoin (Dilantin), which causes an increase in cleft formation, likely vary. The columella appears shorter on the cleft side. The columella has an oblique position, with its base deviated to the noncleft side. The lateral crus of the lower lateral cartilage and the adherent skin are drawn into an S-shaped fold. The lateral crus of the lower lateral cartilage is longer on the cleft side. The lower lateral cartilage is displaced anteriorly on horizontal planes. The nasal tip is displaced in the frontal and horizontal planes following displacement of the lower cartilage. The nasal tip is asymmetric. The vestibular dome is excessively obtuse. The ala is flattened, resulting in a horizontal orientation of the nostril. The nostrils are asymmetrically proportioned. The entire nostril is in a retroposition. The base of the nostril is in a retroposition. The base of the ala is displaced laterally and/or posteriorly or inferiorly. The nasal floor is lower on the cleft side. A nasolabial fistula may be present. The caudal edge of the nasal septum and the anterior nasal spine are deflected into the noncleft vestibule. The nasal septum is deviated, resulting in varying degrees of nasal obstruction on the cleft side. The lower turbinate on the cleft side is hypertrophic. The maxilla is hypoplastic on the cleft side. The maxillary segment is displaced on the cleft side. The premaxilla and maxillary segments are displaced from the noncleft side. Additional descriptions of the anatomy and morphology of these malformations have been well described by Huffman and Lierle. More asymmetry leads to a more noticeable nasal defect. These abnormalities become even more apparent as the child matures. The nasal asymmetry peaks during the postpubertal growth spurt. Deviation of the nasal tip ends at the pubertal growth spurt. In both complete and incomplete clefts, additional dental abnormalities, posterior displacement of the maxilla, and changes in the overall shape of the lower jaw can be found. These further enhance the clinical findings characteristic of the cleft lip nasal deformity. Salyer has emphasized the importance of recognizing these skeletal abnormalities. McComb further stressed the value of repairing bony abnormalities to achieve a successful nasal repair. In the partial unilateral cleft, usually only the inferior portion of the nose is affected, leaving the underlying bone intact. In the complete cleft, all 3 layers (ie, mesoderm, endoderm, ectoderm) are separated, including the underlying bone. Bony problems in patients with repaired clefts may be caused by the surgery itself. The absence of maxillary hypoplasia and class III malocclusion in patients with unrepaired cleft palates suggests the surgical procedures used to correct cleft lip and palate may impair maxillary growth. The resulting midface deficiency also may manifest at the nasal level. The concave facial profile is yet another characteristic appearance of the patient with cleft lip and nose as mandibular growth takes off in adolescence and the maxilla fails to keep up, resulting in a class III malocclusion. Although studies have demonstrated that the cleft nose grows with advancing age, it remains 30% smaller than the noncleft nose. This encourages mouth breathing and continued physiologic difficulties. The cleft lip nasal deformity is of significant concern initially to parents and families, and, later on, to the patients. The primary indication for surgical repair is appearance-related deformity. Patients may also have feeding difficulties, middle ear disease, impaired speech, oronasal fistula, anomalous dentition, and persistent cosmetic deformities. Secondary revisions are often indicated for secondary appearance deformities and nasal breathing obstructions. Contraindications to primary surgical correction of the cleft nose are generally related to the patient's overall poor medical status or other anomalies that require further workup, such as cardiovascular or pulmonary problems. Poor nutritional intake and failure to thrive should also be resolved prior to surgery. In secondary rhinoplasty, a patient’s physical, developmental, or emotional immaturity or desire not to undergo nasal revisions should be considered contraindications to surgery. Ortiz-Monasterio F, Olmedo A. Corrective rhinoplasty before puberty: a long-term follow-up. Plast Reconstr Surg. 1981 Sep. 68(3):381-91. [Medline]. O'Connor GB, McGregor MW, Tolleth H. The management of nasal deformities associated with cleft lips. Pac Med Surg. 1965 Sep-Oct. 73(5):279-85. [Medline]. Gorney M. Rehabilitation for the post-cleft nasolabial stigma. Clin Plast Surg. 1988 Jan. 15(1):73-82. [Medline]. Mazzola RF. Secondary unilateral cleft lip nose: the external approach. Facial Plast Surg. 1996 Oct. 12(4):367-78. [Medline]. Rifley W, Thaller SR. The residual cleft lip nasal deformity. An anatomic approach. Clin Plast Surg. 1996 Jan. 23(1):81-92. [Medline]. Anderl H, Hussl H, Ninkovic M. Primary simultaneous lip and nose repair in the unilateral cleft lip and palate. Plast Reconstr Surg. 2008 Mar. 121(3):959-70. [Medline]. Byrd HS, El-Musa KA, Yazdani A. Definitive repair of the unilateral cleft lip nasal deformity. Plast Reconstr Surg. 2007 Oct. 120(5):1348-56. [Medline]. Salyer KE, Genecov ER, Genecov DG. Unilateral cleft lip-nose repair: a 33-year experience. J Craniofac Surg. 2003 Jul. 14(4):549-58. [Medline]. Rose W. Harelip and Cleft Palate. London, England: HK Lewis; 1891. Randall P. History of cleft lip nasal repair. Cleft Palate Craniofac J. 1992 Nov. 29(6):527-30. [Medline]. Byrd HS. Cleft Lips I: Primary deformities (overview). Selected Readings in Plastic Surgery. 1997. 8(21):1-37. Blair VP. 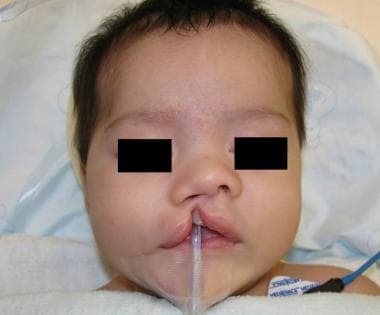 Nasal deformities associated with congenital cleft of the lip. JAMA. 1925. 84:185. Blair VP, Brown JB. Nasal abnormalities, fancied and real surgery. Gynecol Obstet. 1931. 53:797. Brown JB, McDowell F. Simplified design for repair of single cleft lip. Surg Gynecol Obstet. 1945. 80:12. Gillies H, Millard DR. The Principles and Art of Plastic Surgery. Boston, Mass: Little Brown & Co; 1966. 320-37. Berkeley WT. The cleft-lip nose. Plast Reconstr Surg Transplant Bull. 1959 Jun. 23(6):567-75. [Medline]. Musgrove RH. Surgery of nasal deformities associated with cleft lip. Plast Reconstr Surg. 1961. 28:261-74. Cenzi R, Guarda L. A dynamic nostril splint in the surgery of the nasal tip: technical innovation. J Craniomaxillofac Surg. 1996 Apr. 24(2):88-91. [Medline]. Nolst Trenite GJ, Paping RH, Trenning AH. Rhinoplasty in the cleft lip patient. Cleft Palate Craniofac J. 1997 Jan. 34(1):63-8. [Medline]. Brusse CA, Van der Werff JF, Stevens HP, et al. Symmetry and morbidity assessment of unilateral complete cleft lip nose corrected with or without primary nasal correction. Cleft Palate Craniofac J. 1999 Jul. 36(4):361-6. [Medline]. Aufricht G. Presentation at: The Annual Meeting of the American Society of Maxillo-Facial Surgeons. Philadelphia, Pa: 1955. Matthews D. The nose tip. Br J Plast Surg. 1968 Apr. 21(2):153-67. [Medline]. Cronin TD, Denkler KA. Correction of the unilateral cleft lip nose. Plast Reconstr Surg. 1988 Sep. 82(3):419-32. [Medline]. McIndoe A, Rees TD. Synchronous repair of secondary deformities in cleft lip and nose. Plast Reconstr Surg. 1959. 24:150-61. Berkeley WT. Correction of secondary cleft-lip nasal deformities. Plast Reconstr Surg. 1969 Sep. 44(3):234-41. [Medline]. McComb H. Primary correction of unilateral cleft lip nasal deformity: a 10-year review. Plast Reconstr Surg. 1985 Jun. 75(6):791-9. [Medline]. Smahel Z, Mullerova Z, Nejedly A. Effect of primary repositioning of the nasal septum on facial growth in unilateral cleft lip and palate. Cleft Palate Craniofac J. 1999 Jul. 36(4):310-3. [Medline]. McComb HK, Coghlan BA. Primary repair of the unilateral cleft lip nose: completion of a longitudinal study. Cleft Palate Craniofac J. 1996 Jan. 33(1):23-30; discussion 30-1. [Medline]. Smahel Z, Mullerova Z, Skvarilova B, Havlova M. Differences between facial configuration and development in complete and incomplete unilateral cleft lip and palate during the prepubertal period. Acta Chir Plast. 1991. 33(1):47-56. [Medline]. Salyer KE. Primary correction of the unilateral cleft lip nose: a 15-year experience. Plast Reconstr Surg. 1986 Apr. 77(4):558-68. [Medline]. Gelbe H. The nostril problem in unilateral harelips and its surgical management. Plast Reconstr Surg. 1954. 18:65. Stenstrom J, Oberg RH. The nasal deformity in unilateral cleft lips. Plast Reconstr Surg. 1961. 28:295. Green MF. The embryological, developmental and functional importance in the repair of the nasal musculature to reduce the deformity of the cleft lip nose. Scand J Plast Reconstr Surg Hand Surg. 1987. 21(1):1-5. [Medline]. Byrd HS, Salomon J. Primary correction of the unilateral cleft nasal deformity. Plast Reconstr Surg. 2000 Nov. 106(6):1276-86. [Medline]. McComb HK. Primary repair of the bilateral cleft lip nose: a long-term follow-up. Plast Reconstr Surg. 2009 Nov. 124(5):1610-5. [Medline]. Morselli PG, Pinto V, Negosanti L, Firinu A, Fabbri E. Early correction of septum JJ deformity in unilateral cleft lip-cleft palate. Plast Reconstr Surg. 2012 Sep. 130(3):434e-41e. [Medline]. Haddock NT, McRae MH, Cutting CB. Long-term effect of primary cleft rhinoplasty on secondary cleft rhinoplasty in patients with unilateral cleft lip-cleft palate. Plast Reconstr Surg. 2012 Mar. 129(3):740-8. [Medline]. Gosla-Reddy S, Nagy K, Mommaerts MY, et al. Primary septoplasty in the repair of unilateral complete cleft lip and palate. Plast Reconstr Surg. 2011 Feb. 127(2):761-7. [Medline]. Hoffman W. Unilateral Cleft Lip Repair. Bentz ML, Bauer BS, Zuker RM, eds. Principles & Practice of Pediatric Plastic Surgery. 2nd ed. Quality Medical Publishing; 2007. Vol 1: 439-453. Bernstein L. Maxillofacial clefts. Paparella MM, Shumrick DA, Gluckman JL, Meyerhoff WL, eds. Otolaryngology. 3rd ed. Philadelphia, Pa: WB Saunders; 1991. Vol 3: 1983. Kyrkanides S, Bellohusen R, Subtelny JD. Asymmetries of the upper lip and nose in noncleft and postsurgical unilateral cleft lip and palate individuals. Cleft Palate Craniofac J. 1996 Jul. 33(4):306-11. [Medline]. Siegel MI, Mooney MP, Kimes KR, Gest TR. Traction, prenatal development, and the labioseptopremaxillary region. Plast Reconstr Surg. 1985 Jul. 76(1):25-8. [Medline]. Stark RB, Kaplan JM. Development of the cleft lip nose. Plast Reconstr Surg. 1973 Apr. 51(4):413-5. [Medline]. Millicovsky G, Ambrose LJ, Johnston MC. Developmental alterations associated with spontaneous cleft lip and palate in CL/Fr mice. Am J Anat. 1982 May. 164(1):29-44. [Medline]. Johnston MC, Millicovsky G. Normal and abnormal development of the lip and palate. Clin Plast Surg. 1985 Oct. 12(4):521-32. [Medline]. Millard DR. The Unilateral Deformity. Cleft Craft: The Evolution of its Surgery. Boston, Mass: Little Brown & Co; 1976. Vol 1: 20. Huffman WC, Lierle DM. Studies on the pathologic anatomy of the unilateral hare-lip nose. Plast Reconstr Surg. 1949. 4:225. Kyrkanides S, Bellohusen R, Subtelny JD. Skeletal asymmetries of the nasomaxillary complex in noncleft and postsurgical unilateral cleft lip and palate individuals. Cleft Palate Craniofac J. 1995 Sep. 32(5):428-33. [Medline]. Farkas LG, Deutsch CK, Hreczko TA. Asymmetries in nostrils and the surrounding tissues of the soft nose--a morphometric study. Ann Plast Surg. 1984 Jan. 12(1):10-5. [Medline]. Atherton JD. A descriptive anatomy of the face in human fetuses with unilateral cleft lip and palate. Cleft Palate J. 1967 Apr. 4:104-14. [Medline]. Li AQ, Sun YG, Wang GH, Zhong ZK, Cutting C. Anatomy of the nasal cartilages of the unilateral complete cleft lip nose. Plast Reconstr Surg. 2002 May. 109(6):1835-8. [Medline]. Bardach J, Cutting C. Anatomy of unilateral and bilateral cleft lip and nose. Bardach J, Morris HL, eds. Multidisciplinary Management of Cleft Lip and Palate. Philadelphia, Pa: WB Saunders; 1990. 154-8. Latham RA. The pathogenesis of the skeletal deformity associated with unilateral cleft lip and palate. Cleft Palate J. 1969 Oct. 6:404-14. [Medline]. Warren DW, Drake AF. Cleft nose. Form and function. Clin Plast Surg. 1993 Oct. 20(4):769-79. [Medline]. Wahlmam U, Kunkel M, Wagner W. Preoperative assessment of airway patency in the planning of corrective cleft nose surgery. Mund Kiefer Gesichtschir. 1998 May. 2 Suppl 1:S153-7. [Medline]. Drake AF, Davis JU, Warren DW. Nasal airway size in cleft and noncleft children. Laryngoscope. 1993 Aug. 103(8):915-7. [Medline]. Chowchuen B, Keinprasit C, Pradubwong S. Primary unilateral cleft lip-nose repair: the Tawanchai cleft center's integrated and functional reconstruction. J Med Assoc Thai. 2010 Oct. 93 Suppl 4:S34-45. [Medline]. Jeong HS, Lee HK, Shin KS. Correction of Unilateral Secondary Cleft Lip Nose Deformity by a Modified Tajima's Method and Several Adjunctive Procedures Based on Severity. Aesthetic Plast Surg. 2011 Jul 15. [Medline]. Puckett CL, Wells HG Jr. The gull wing incision in cleft lip rhinoplasty. Cleft Palate J. 1987 Apr. 24(2):163-7. [Medline]. Morioka D, Sato N, Kusano T, et al. Difference in nasolabial features between awake and asleep infants with unilateral cleft lip: Anthropometric measurements using three-dimensional stereophotogrammetry. J Craniomaxillofac Surg. 2015 Oct 25. [Medline]. Demirseren ME, Ohkubo F, Kadomatsu K, Hosaka Y. A simple method for lower lateral cartilage repositioning in cleft lip nose deformity. Plast Reconstr Surg. 2004 Feb. 113(2):649-52. [Medline]. Molina F. Distraction of the maxilla. McCarthy JG, ed. Distraction of the Craniofacial Skeleton. 1st ed. New York: Springer-Verlag; 1999. 308-20. Barillas I, Dec W, Warren SM, Cutting CB, Grayson BH. Nasoalveolar molding improves long-term nasal symmetry in complete unilateral cleft lip-cleft palate patients. Plast Reconstr Surg. 2009 Mar. 123(3):1002-6. [Medline]. Alajmi H, Tahiri Y, Jamal B, Gilardino MS. Montreal children's hospital formula for nasoalveolar molding cleft therapy. Plast Reconstr Surg. 2013 Feb. 131(2):349-53. [Medline]. Liao YF, Hsieh YJ, Chen IJ, Ko WC, Chen PK. Comparative outcomes of two nasoalveolar molding techniques for unilateral cleft nose deformity. Plast Reconstr Surg. 2012 Dec. 130(6):1289-95. [Medline]. van der Heijden P, Dijkstra PU, Stellingsma C, van der Laan BF, Korsten-Meijer AG, Goorhuis-Brouwer SM. Limited evidence for the effect of presurgical nasoalveolar molding in unilateral cleft on nasal symmetry: a call for unified research. Plast Reconstr Surg. 2013 Jan. 131(1):62e-71e. [Medline]. Smith DM, Macisaac ZM, Losee JE. Discussion: Limited evidence for the effect of presurgical nasoalveolar molding in unilateral cleft on nasal symmetry: a call for unified research. Plast Reconstr Surg. 2013 Jan. 131(1):72e-4e. [Medline]. Grayson BH. Discussion: Limited evidence for the effect of presurgical nasoalveolar molding in unilateral cleft on nasal symmetry: a call for unified research. Plast Reconstr Surg. 2013 Jan. 131(1):75e-6e. [Medline]. Abbott MM, Meara JG. Nasoalveolar molding in cleft care: is it efficacious?. Plast Reconstr Surg. 2012 Sep. 130(3):659-66. [Medline]. Chang CS, Por YC, Liou EJ, Chang CJ, Chen PK, Noordhoff MS. Long-term comparison of four techniques for obtaining nasal symmetry in unilateral complete cleft lip patients: a single surgeon's experience. Plast Reconstr Surg. 2010 Oct. 126(4):1276-84. [Medline]. de Sá Nóbrega ES. Cleft lip nose: a different approach. J Craniofac Surg. 2005 Jan. 16(1):95-9. [Medline]. Yeow VK, Chen PK, Chen YR, Noordhoff SM. The use of nasal splints in the primary management of unilateral cleft nasal deformity. Plast Reconstr Surg. 1999 Apr. 103(5):1347-54. [Medline]. Salyer KE. Early and late treatment of unilateral cleft nasal deformity. Cleft Palate Craniofac J. 1992 Nov. 29(6):556-69. [Medline]. Latham RA. Orthopedic advancement of the cleft maxillary segment: a preliminary report. Cleft Palate J. 1980 Jul. 17(3):227-33. [Medline]. Gassling V, Koos B, Birkenfeld F, Wiltfang J, Zimmermann CE. Secondary cleft nose rhinoplasty: Subjective and objective outcome evaluation. J Craniomaxillofac Surg. 2015 Nov. 43 (9):1855-62. [Medline]. Cronin ED, Rafols FJ, Shayani P, Al-Haj I. Primary cleft nasal repair: the composite V-Y flap with extended mucosal tab. Ann Plast Surg. 2004 Aug. 53(2):102-8; discussion 109-10. [Medline]. Millard DR Jr, Morovic CG. Primary unilateral cleft nose correction: a 10-year follow-up. Plast Reconstr Surg. 1998 Oct. 102(5):1331-8. [Medline]. Miyamoto J, Nagasao T, Nakajima T, Ogata H. Evaluation of cleft lip bony depression of piriform margin and nasal deformity with cone beam computed tomography: "retruded-like" appearance and anteroposterior position of the alar base. Plast Reconstr Surg. 2007 Nov. 120(6):1612-20. [Medline]. Masuoka H, Kawai K, Morimoto N, Yamawaki S, Suzuki S. Open rhinoplasty using conchal cartilage during childhood to correct unilateral cleft-lip nasal deformities. J Plast Reconstr Aesthet Surg. 2012 Jan 23. [Medline]. Guyuron B. MOC-PS(SM) CME article: late cleft lip nasal deformity. Plast Reconstr Surg. 2008 Apr. 121(4 Suppl):1-11. [Medline]. Black PW, Hartrampf CR Jr, Beegle P. Cleft lip type nasal deformity: definitive repair. Ann Plast Surg. 1984 Feb. 12(2):128-38. [Medline]. Gubisch W. Functional and aesthetic nasal reconstruction in unilateral CLP-deformity. Facial Plast Surg. 1995 Jul. 11(3):159-68. [Medline]. Cho BC, Lee JH, Cohen M, Baik BS. Surgical correction of unilateral cleft lip nasal deformity. J Craniofac Surg. 1998 Jan. 9(1):20-9. [Medline]. Duffenbach JF. Dil Operative "Chirugie" Leipzieg, Brochaus. 1845. 362-92. Wong GB, Burvin R, Mulliken JB. Resorbable internal splint: an adjunct to primary correction of unilateral cleft lip-nasal deformity. Plast Reconstr Surg. 2002 Aug. 110(2):385-91. [Medline]. Kim SK, Cha BH, Lee KC, Park JM. Primary correction of unilateral cleft lip nasal deformity in Asian patients: anthropometric evaluation. Plast Reconstr Surg. 2004 Nov. 114(6):1373-81. [Medline]. Patil PG, Patil SP, Sarin S. Nasoalveolar molding and long-term postsurgical esthetics for unilateral cleft lip/palate: 5-year follow-up. J Prosthodont. 2011 Oct. 20(7):577-82. [Medline]. Freeman AK, Mercer NS, Roberts LM. Nasal asymmetry in unilateral cleft lip and palate. J Plast Reconstr Aesthet Surg. 2013 Jan 22. [Medline]. Gillies H, Kilner TP. 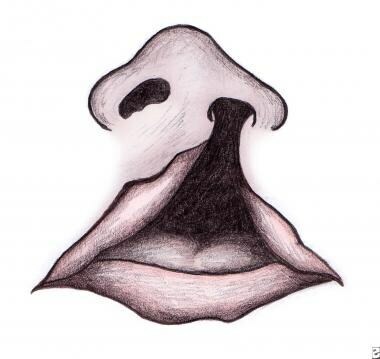 Hare-lip: operations for the correction of secondary deformities. Lancet. 1932. 2:1369. Janiszewska-Olszowska J, Gawrych E, Wedrychowska-Szulc B, Stepien P, Konury J, Wilk G. Effect of primary correction of nasal septal deformity in complete unilateral cleft lip and palate on the craniofacial morphology. J Craniomaxillofac Surg. 2012 Dec 26. [Medline]. Lewis MB, Winkler AA, Silverman RP. Correction of the unilateral cleft lip nasal deformity with a composite cartilage-vestibular lining flap. Plast Reconstr Surg. 2007 Oct. 120(5):1357-62. [Medline]. Liou EJ, Subramanian M, Chen PK, Huang CS. The progressive changes of nasal symmetry and growth after nasoalveolar molding: a three-year follow-up study. Plast Reconstr Surg. 2004 Sep 15. 114(4):858-64. [Medline]. Ridgway EB, Andrews BT, Labrie RA, Padwa BL, Mulliken JB. Positioning the caudal septum during primary repair of unilateral cleft lip. J Craniofac Surg. 2011 Jul. 22(4):1219-24. [Medline]. Wolfe SA. A pastiche for the cleft lip nose. Plast Reconstr Surg. 2004 Jul. 114(1):1-9. [Medline]. The nasal cartilage is displaced laterally, inferiorly, and posteriorly, and has inadequate form and support. Cleft nose repair at the time of cleft lip repair with rim incision, interdomal suturing, and alar base cinching. These techniques restore the position and tip support for the cleft nose. Additional view of patient shown above. The authors and editors of Medscape Reference gratefully acknowledge the contributions of previous authors Zachary Segal, MD; W Scott McDonald, MD; and Seth R Thaller, MD, DMD, FACS, FAAP to the development and writing of this article.